A Welsh constituency known in previous years for it’s coal mining industry and MP Neil Kinnock, the former Labour Party leader. The area encompasses the towns of Blackwood, Risca, Oakdale, Pontllanfraith and Newbridge. 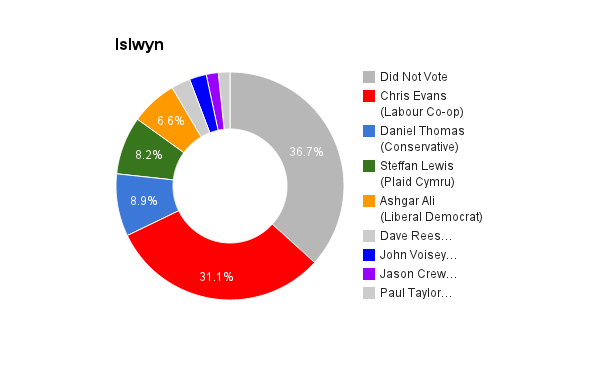 The current MP is Labour’s and the Co-operative Party’s Chris Evans, first elected in 2010 succeeding Dan Touhig a previous Labour/Co-operative candidate. I was born in 1957 in Salisbury. I went to school at Bettws after my family moved to Newport in 1971. I worked as a software engineer for several years, then returned to university to study as a mature student at Cardiff University, gaining a Masters degree in Energy and a PhD in Computer Science. I am a member of the Institution of Engineering and Technology. 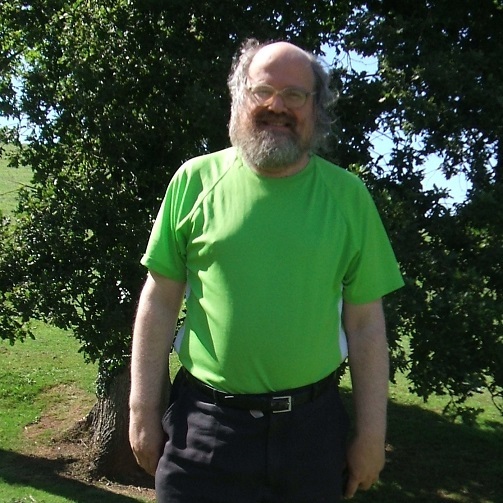 I was the Green Party’s lead candidate for South-East Wales in the 2003 Assembly Election, and the candidate for Newport West in the 2005 General Election. At the time, I was active on the local coordinating committee of One World Week and in the Stop the War Coalition. Since then, I worked abroad for seven years in Japan and Spain. I am now back in Wales and living once again on Bettws. 1. End the austerity agenda by introducing a Citizens’ Income. 2. Bring essential infrastructure back into public ownership, starting with the railways. 4. Stop using unsustainable, polluting energy sources. 5. Keep our food safe to eat. 6. Defend ourselves and our future without attacking others. I would follow the example of the current MP. In particular, I would maintain an accessible constituency office close to the major bus route, and I would continue the tradition of Saturday morning surgeries around the constituency. Within the House of Commons, most of the important work is done by committees. During my years employed in the software engineering industry, and later in academic research, I have served on several committees and I understand how they work. I would use my thoroughness and eye for detail to make legislation “greener” and to get a good deal for my constituents. The current MP has set an excellent precedent for keeping in touch with his constituents. In particular, he maintains an accessible constituency office close to the major bus route, holds Saturday morning surgeries around the constituency. I would follow his example (see question 1). No, austerity is not working. People are starving. The state of the economy was bad enough when the current government came to power; it is now even worse. It is vital that the nations of the British Isles remain part of the worldwide community of nations. People from other nations should be free to move to Britain, just as people from Britain should be free to move abroad; ideally, the numbers would balance out. We currently import 44% of our energy and more than 40% of our food. Prices will continue to rise until (a) we generate our own sustainable energy, making us independent of world price rises, and (b) regenerate our manufacturing industry, so we have something to trade for the food we need. We must invest in both. I would be wary of too much change – there are problems to be fixed, but on the whole the NHS still works well. My own GP has open morning surgeries (this is something which should not be changed) but afternoon appointments can only be booked three weeks in advance (this is a problem which should be fixed). Here on Bettws, we have an NHS dentist. Other parts of Gwent are not so lucky. This is another problem which should be fixed. We should increase the provision of NHS dentists (and treatment should be free). One major change which I would like to see is the integration (and joint funding) of health and social care. Social care is an essential part of healthcare, and should also be free at the point of use and provide equal support for equal need. We have to recognise that more and more work is being automated and full employment is an illusion. The days when people defined themselves by their paid employment are over. We have to make sure that, even without paid employment, people have enough to live on. This is the primary purpose of the Universal Basic Income (question 4). We also have to make sure that people have useful and interesting things to do with their time. The Green Party answer to this is to encourage active participation in cultural and sporting activities, not just passive consumption. Yes. The shockingly low turnout in many elections shows that the electorate feels that none of the candidates on offer represents them. One in seven MPs comes from the financial services industry. One in seven is a lawyer. One in seven has never had any career outside politics (that’s one in five if you include trades union officials). Is it any wonder that the country is run for the benefit of lawyers and fund managers? But the problem is deeper than that. The lack of diversity in Parliament is a reflection of the lack of diversity in Parliamentary candidates. Until political parties start selecting candidates from more diverse backgrounds, candidate who don’t look like political clones, nothing will change. I would encourage everyone to vote to remain in the EU. The EU needs to be reformed, and we can only push for that if we are part of it.